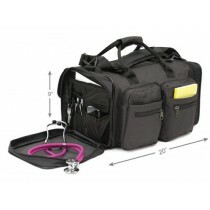 Medical Bags and Nursing bags help medical professionals feel prepared and organized for any given situation. They keep supplies neatly in place and ensure patient records are maintained and protected. 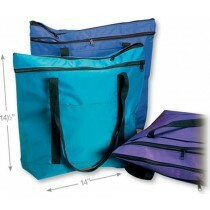 These medical equipment bags and totes offer ultimate organization and dependability. 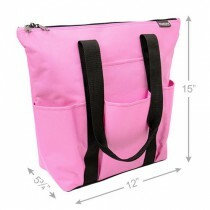 Doctor Totes are essential for medical professionals on the go. 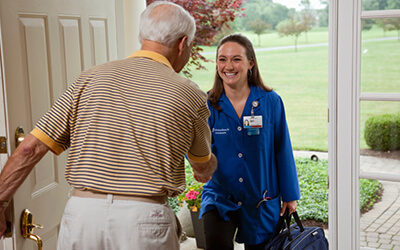 They contain and carry the necessary medical items for patient treatment and care within the home, at nursing facilities, for clinic visits, or house calls. 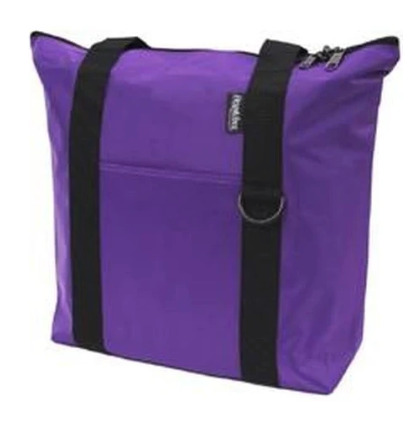 Many of these bags are available in multiple colors and sizes and contain a variety of medical equipment that allows you help treat your patients with the highest quality and precision. 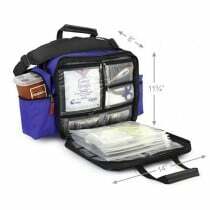 Treating patients outside of a medical facility can be difficult when your resources are limited, but having the medical basics available within a convenient tote can help you give your patients the best possible treatment on the go. 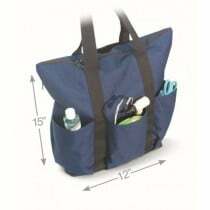 A Nurse Tote Bag and Medical Tote Bag provides storage of essential items, such as medical dressing, gauze rolls, stethoscopes, debridement fluid, medicated ointments, travel size sharps containers, scissors, pain relieving products, and more. 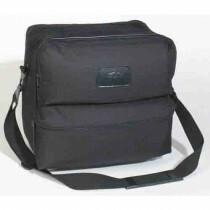 Each bag is designed to be highly durable with multiple storage compartments and sturdy shoulder straps for easy portability. 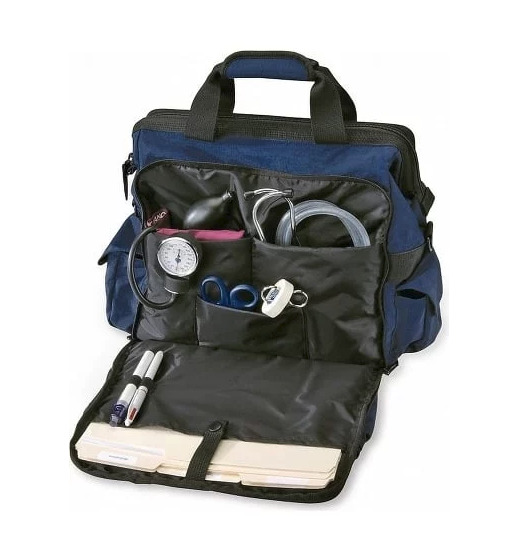 How I know which medical tote is right for me? 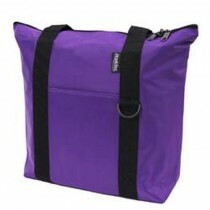 There are two types: empty, which are typically classified as "nursing bags" and pre-filled bags, which come equipped with select medical products. 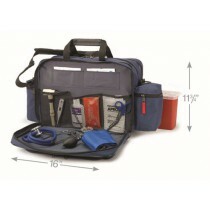 Medical equipment bags are available with or without supplies included. The filled bags feature a variety of medical supplies that help you give your patients quality treatment, an empty bag gives you the opportunity to pick and choose the supplies you require for your particular patient care needs. 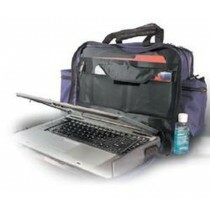 Some bags feature storage for medical records and come equipped with a laptop compartment for convenience and easy storage of patient records. 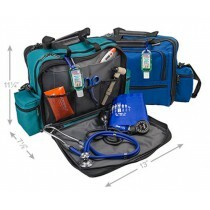 Examples of these styles include the Hopkins Medical Products Medical Tote with Records Pockets and the Hopkins Medical Products Nurse Bag with Laptop Compartment. 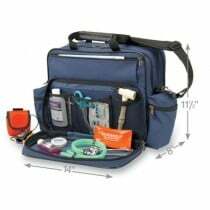 Nursing bags are available with an EZ view feature, which is a see-through, re-sealable pouch that allows you to quickly locate and access items at a glance. Learning More about Proper "Bag Technique"
Medical professionals, who frequently treat patients within the home and rely on the use of a carry-along medical bag, are required to have a thorough comprehension of the principles of "bag technique," which prevents the transmission of pathogenic microorganisms. This technique helps medical professionals manage the tote bag, it's contents, and keep harmful pathogenic microorganisms from being brought into the patients home or transferred from one home to another.